Amy Grech is an Active Member of the Horror Writers Association and the International Thriller Writers. She lives in Brooklyn. Amy Grech's stories shock, like a sudden, splash of cold water. 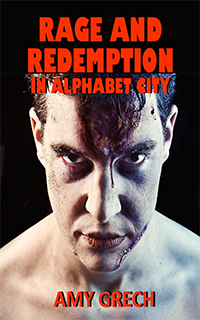 This latest collection delivers gritty profiles of people snarled in the crime and seething anger of inner city New York at its most violent. Here you'll encounter five dark tales—"Rage and Redemption in Alphabet City", ".38 Special", "Cold Comfort", "Prevention", and "Hoi Polloi Cannoli"—actually 12, if you count the literary parts. These startling stories will convince you that Grech is noir and horror writer you want to watch. So far, over 100 of Any Grech's stories have been published in various anthologies and magazines including: Apex Magazine, Beat to a Pulp: Hardboiled, Dead Harvest, Expiration Date, Fear on Demand, Funeral Party 2, Inhuman Magazine, Needle Magazine, Reel Dark, Shrieks and Shivers from the Horror Zine, Space & Time, The Horror Within, Under the Bed, Detectives of the Fantastic, Volume II, and many others. Check out Lee Thompson's interview with author Amy Grech!